Animal rights activists from the NGO Hard To Port projected images of dying whales on the walls of Icelandic restaurant Fjalakötturinn in Reykjavík. In a press release sent to Iceland Monitor it says, "The graphic footage was displayed in order to highlight and raise awareness about the brutal hunt of minke whales in Icelandic coastal waters." Local animal rights advocacy group ‘Aktívegan’ joined the protest later on Sunday by gathering in the streets of Reykjavík equipped with anti-whaling banners and information leaflets. 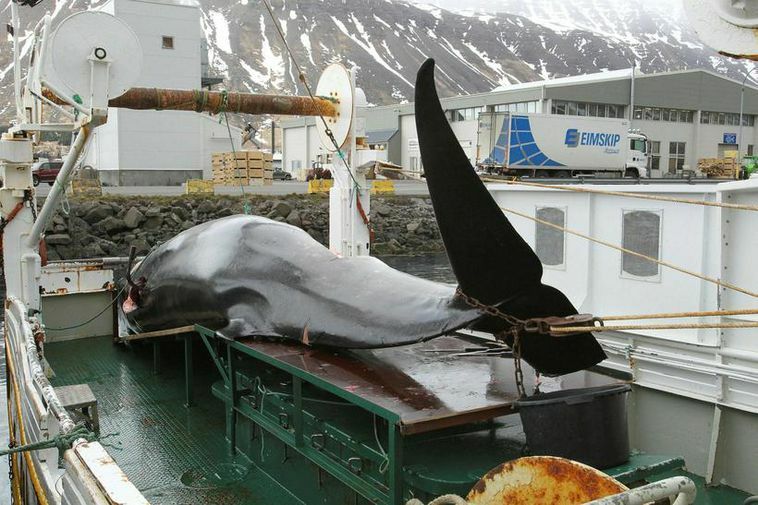 Both groups point out and criticize what they consider to be the missing transparency of whaling operations in Iceland. “Whaling is an abhorrent form of animal cruelty that should not be ignored and tolerated. The main problem is, that these operations are not visible to the public and therefore not a lot of people are questioning them. We demand the release of uncensored footage of minke whale hunts. Here in Faxaflói Bay, Icelanders and hundreds of thousands of tourists encounter these animals in a respectful and peaceful way every year.These people have a right to know what happens to these whales when they are chased by harpoon boats.” says Hard To Port’s spokesperson Arne Feuerhahn. Furthermore, the statement goes on to say, "Minke whale meat is sold domestically in supermarkets and restaurants around Iceland, despite the fact that only 3% of the population consume it regularly. The demand is mostly driven by tourists, who are made to believe that whale meat is a traditional Icelandic dish."